As a leading expert in strategic human resource management with a focus on international management, global leadership development, and international assignee management, Paula has been recognized as one of the most prolific authors in the field of international business for her work in global careers and global leadership development and has lectured in numerous universities in the United States, Asia, and Europe. Paula is also a popular blogger on these topics (www.PaulaCaligiuri.com). Her publishing successes includes a co-authored a book with Steven Poelmans, entitled Harmonizing Work, Family, and Personal Life (Cambridge Press, 2008) and Get a Life, Not a Job (FT Press, 2010), several articles in the International Journal of Human Resource Management, Journal of World Business, Journal of Applied Psychology, Personnel Psychology, and International Journal of Intercultural Relations. Before joining ESADE, Jaime was Professor of Human Resources at Cranfield School of Management (England) and Carlos III University of Madrid (Spain). In 2007 he attained his habilitation as Professor of Organization Studies, the highest academic qualification a person can achieve in Spain. Jaime holds an M.A. in Philosophy from Carleton University (Ottawa, Canada), and a Ph.D. in Economics and Business Administration from the Universidad Autónoma de Madrid (Spain). Jaime has written/edited four books, two of them (Dirección Estratégica de Personas and Dirección de Personas, with Angel Cabrera) have been best-sellers in a number of Spanish-speaking countries. He has been guest editor of three special issues on trends in international human resources and published a large number of articles in leading journals, includingOrganization Studies, Human Resource Management Journal, The International Journal of HRM, Journal of Business Research, and HRM Review. Jaime is a frequent speaker at academic and professional conferences and is widely recognized as one of Europe's leading authorities on international human resource management. David received his PhD in management from the Pennsylvania State University and is a leading scholar in the strategic management of human resources and teaches and conducts research on a variety of human resource topics with dual interests in strategic human resource management and international human resource management. He is a frequent presenter to many domestic and international audiences. David has co-authored a comprehensive textbook with Mary Gowan, entitled Human Resource Management (Prentice Hall, 2008). His research has appeared in a variety of outlets such as: Research in Personnel and Human Resource Management, Academy of Management Review, Academy of Management, Journal, Journal of Applied Psychology, Journal of Management, Human Resource, Management, Human Resource Management Review, among others. Chapter 1 Introduction to International Dimensions of Human Resource Management. Chapter 2 Global Business Strategy: The Foundation for Managing the Global Workforce. Chapter 3 Comparative HR Systems: The Context for Managing the Global Workforce. Chapter 4 Cross-cultural Differences: The Cultural Lens for Managing the Global Workforce. 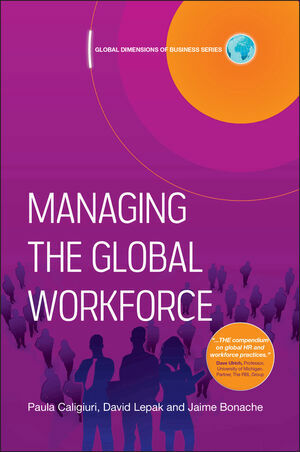 Chapter 5 Global Workforce Planning: The Global Mobility of People, Jobs, and Knowledge. Chapter 6 Managing Competencies: Recruitment, Selection, Training and Development of the Global Workforce. Chapter 7 Managing Attitudes and Behavior: Motivating and Rewarding the Global Workforce.